J.M. "Jaro" Albright, 86, of Mt. 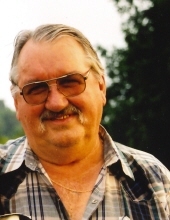 Vernon formerly of Crab Orchard, passed away Wednesday, March 20th, at the Compassionate Care Center in Richmond. Jaro was born on April 1, 1932 in Brodhead, Kentucky to the late J.T. & Pearl (Smith) Albright. He was the husband of Birdie (DeBord) Albright whom he married on July 31, 2016. Jaro had worked as a truck driver for Gulf States Paper for 32 years. He was a member of the Crab Orchard Baptist Church, the Lancaster Masonic Lodge 104 F&AM and also a member 32nd Degree Scottish Rite Freemasonry. Survivors Include his Wife, Birdie Albright of Mt. Vernon; Son, Jeff Albright & Wife, Lissa of Crab Orchard; Daughter-In-Law, Connie Albright of Crab Orchard; Sister, Laverne Robertson of Louisville; 4 Grandchildren: Dayna & Husband Todd Carmicle of Danville, Joseph Albright & Wife Alaina of Lexington, Dr. Kayla & Husband Danny McCreedy of Mt. Washington, and McKenzie & Husband Eric Hanson of Newport; 4 Great Grandchildren: Shaylan, Emerie & Tristen Helton and Jay Hanson; 1 Great Great Grandchild: Jaxton Devine; and Several Nieces and Nephews also survive. In addition to his parents, Jaro was preceded in death by his first wife, Erna (Howard) Albright; Two Sons, Jimmy Douglas and J.M. "Joey" Albright; Brother, Keith Albright; Two Sisters, Marge Brock & Juanita Karnes. Serving as Pallbearers as are Todd Carmicle, Tristen Helton, Casey Mason, Michael Haarman, Jerry DeBord, Danny McCreedy, Eric Hanson & Joseph Albright. Funeral Services 1:00 PM, Saturday, March 23, 2019 at McKnight Funeral Home Chapel with Bro. Mark Shelton officiating. Burial will be in the Crab Orchard Cemetery. Visitation will be after 6PM on Friday, March 22, 2019 at McKnight Funeral Home with a Masonic service beginning at 7pm. To send flowers or a remembrance gift to the family of J.M. "Jaro" Albright, please visit our Tribute Store. "Email Address" would like to share the life celebration of J.M. "Jaro" Albright. Click on the "link" to go to share a favorite memory or leave a condolence message for the family.